Guest post by St. Louis-area collaborator and comrade Ben Lind. Comments and questions are welcome in the comments section or at maosoleumblog@gmail.com. The Menard Correctional Center was built in 1878 and is the largest maximum security institution in the Illinois state prison system. Menard is grossly overcrowded and the prisoners suffer from all of the ills one would expect from too many people packed into old decaying buildings. On the 15th of January a group of prisoners decided to press their common grievances by way of a hunger strike. Though reports vary, upwards of 21 prisoners began the strike and it seems that others have joined them. The response by corrections staff to the strike has included stripping the prisoners of clothing and personal possessions as well as reports of beatings and threats of forced feedings by medical staff – note forced feeding in this context is an extremely brutal punitive process in which a which a thick plastic tube is shoved down a fully conscious prisoner’s throat and then food is injected into the tube, a practice considered torture by the Tokyo Declaration of the World Medical Association since 1975. In any case the prison authorities seem to be intent on greeting the prisoners demands with violent repression but the prisoners are also intent on holding firm. We comrades decided to organize an outside noise demo, and gathered around noon and one thing was absolutely clear to all of us, it was gonna be cold! It was 10F when I left home in the morning and was probably colder when we arrived in Menard. The site of the prison itself is intimidating, located at the foot of some bluffs with only one access road running in front of the institution. Upon arrival we met up with comrades from other cities at a small picnic area on the edge of the prison grounds and marched to the front gate with music blaring from a portable sound-system powered by car battery and all the while loudly chanting our support for the hunger strikers. By coincidence we showed up at the same time as a shift change of the prison staff. We were treated to a parade of rubber necking Correctional Officers who laughed, pointed, took pictures,etc. as they drove by. We marched through the parking lot in front of the prison until guards hustled out to warn us that we could not be on prison property. We lined up across the street from the prison, blasted music, chanted and beat on drums and pots so that the prisoners might hear that someone was there to support them. We carried 2 banners and stood high on a railway embankment so prisoners and staff would see them. Local Chester cops began filing into the parking lot across from us and they conferred with guards who were watching us and taking pictures. After we had been there about 30 minutes we decided to march back to cars and go home. We noticed that one of the Chester cop SUV’s had driven to where our cars were parked and the cops were taking down the plate numbers of our cars , probably to call them in and check for warrants. We stayed together in a group so no one could be picked off in isolation and when we got back to the cars the cop let us leave without bother. We had a pretty good turnout all things considered and are hoping that a message was conveyed to the prisoners that folks outside the walls are aware of their hunger strike and moreover willing to act in solidarity with them. A new period of struggle has been initiated in the prison system of the United States, the world’s largest and by no means least brutal. The California prisoners hunger strike of 2013 marked a ramping up of this conflict. 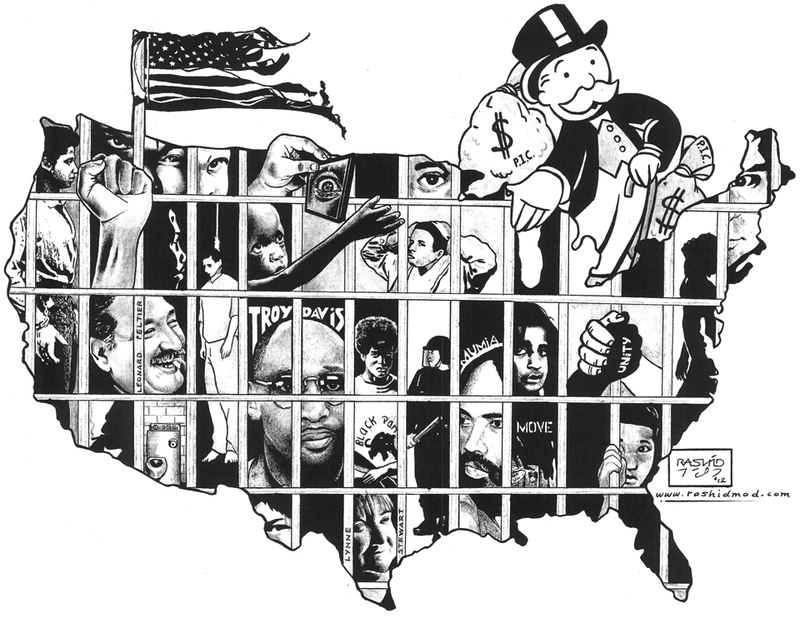 The hunger strike of the Menard prisoners represents the opening up of yet another front in what looks to be a long season of confrontation against the cruelly oppressive, racist Amerikan penal system.